Should the Confederate flag be removed? Apple CEO Tim Cook is speaking out about the massacre at Emanuel African Methodist Episcopal Church in South Carolina, saying more must be done to eradicate racism. "My thoughts are with the victim's families in SC. Let us honor their lives by eradicating racism & removing the symbols & words that feed it," Cook said Sunday on Twitter. 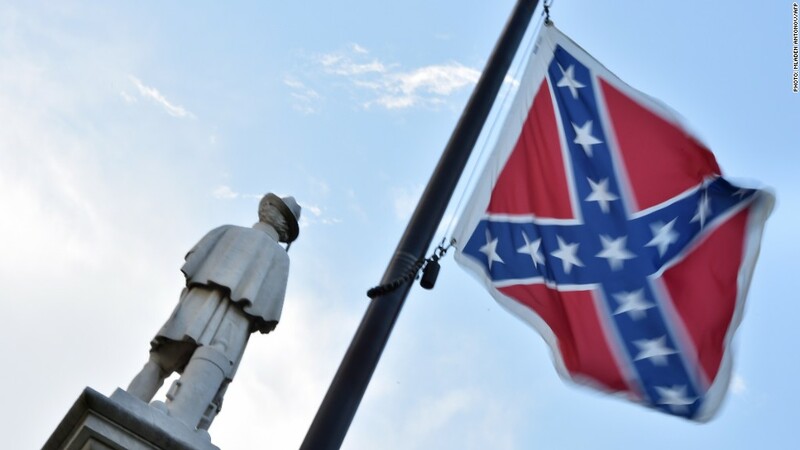 Most Twitter users interpreted Cook's words as a call to remove the Confederate battle flag from the South Carolina Capitol. Taking down the flag has become a rallying cry for activists in the wake of the racially-motivated shooting that ended the lives of nine church members. Some on Twitter (TWTR) thought that Cook could use his post at Apple (AAPL) to do even more. "Isn't it time Apple leads from the front by refusing to do business in SC?" one Twitter user asked Cook, an Alabama native and self-described "son of the South." Cook wasn't the only tech CEO asking for the flag's removal. Marc Benioff, the CEO of Salesforce.com (CRM), endorsed a message from former Republican presidential nominee Mitt Romney that advocated removing the Confederate flag. "I agree @MittRomney: Take down the #ConfederateFlag at the SC Capitol. To many, it is a symbol of racial hatred. Remove to honor victims," he tweeted.